Buckeye Cranberry Sparkler (8745) 07/27/1998 (P. Hancock) Semidouble bright pink ruffled pansy/variable raspberry fantasy; raspberry edge. Variegated dark green, cream and pink, plain, glossy/red back. Large (DAVS 1621) This plant consequentially wins in shows. Very limited availability at this time. Order of 10 pairs of leaves will ship for same postage as one. 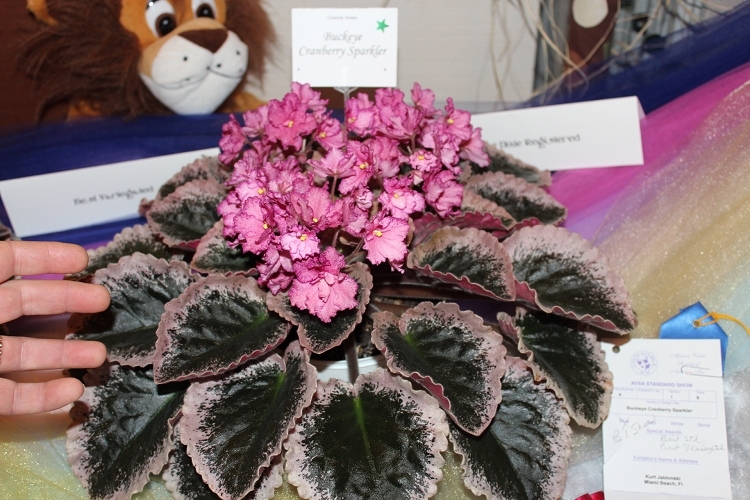 Plus we will throw in a species African Violet pair of leaves for free, if you mention it. Every African Violet grower should save space on their shelf for the endangered species. Did you read my article in AVSA magazine. I will include it below. So thankful and blessed I am not forced into this position with plenty of space to house my ever growing collection. But what if? Can you even imagine? There is so much choice in today’s choices with First Class software showing over 18,000 varieties! Let’s see, do I want to pick a large standard, a standard, a compact standard, semi miniature, or miniature. How about chimeras? Then there is the choice of regular or variegated foliage, and within the variegated “category” is mosaic, crowned and Tommie Lou. Just trying to make this decision is a challenge. Now the flower colors. Blue, purple, pink, red, lavender, white, green, yellow and all shades and combinations in between. This does not look like it is going to get easier. Single, double, semi double flowers with frilled, pansy, star, ruffled , bell, fantasy, fringed, edged, Geneva, bicolor, tri color and wasp to list most of them and I am sure I am leaving out several more flower types. Then there are combinations within this group. Choices, choices, choices. Holly foliage. (I love this foliage but hope I am not giving away my choice) This is heavily crested leaves with the leaf edges curled forward or bent back with exaggerated wavy edges resembling holly leaves in form. Longifolia or Spider foliage are narrow pointed strap-like leaves with plain or wavy edges. Interesting indeed. Quilted leaves have distinct raised areas between the veins and all sorts of variations. Ruffled, Fringed, Wavy and fluted leaves add to the choices. These have serrated or ragged edges. Spooned leaves are another favorite of mine with leaves cupped up like a spoon. Gee, again, I hope I am not giving away my choice. But as I questioned in the first paragraph…..can you imagine? So much has happened just within my lifetime. Although the ten original hybrids introduced by the greenhouses of Armacost & Royston were before my time. Pink flowers, and then untold colors of every hue have been released. Non dropping flowers or “stick tights occurred in 1965, Miniature and semi miniature plants came into existence. 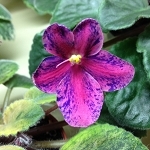 I can still remember the sensation Tommie Lou, the first variegated violet, caused in the horticultural community. Can you imagine, the Tinari’s were asking an outrageous $1.25 for a plant of this while everything else was being sold for 45 to 65 cents? I am thankful, I still have several of their catalogs. Every year new developments occur. Flowers bigger than golf balls are not uncommon. Additional flower stems for more flowers are showing up on newer hybrids. My garden center customers ask for ever bigger flowers and for scented ones. Is this in the future? But, there is ONE plant or certainly a small number of plants with all this beauty hidden in its genetics. That plant is the one found in Nature. Saintpaulia ionantha, the original African violet, and perhaps a couple of others, have contributed all this beauty we enjoy today. Who could imagine everything we enjoy today about modern day African violets is hidden within the makeup of this species? I can just look at this simple little violet and imagine all the beauty and history within. You can’t do that with any of the hybrids. It rightfully deserves a choice spot in my collection. I can look at this plant and envision Baron Walter von Saint Paul trekking his way through virgin cloud forest in Tanzania in 1892. Feasting his eyes on this little forest dwelling hairy leafed beauty, I am sure he had no idea what impact it would have in modern day ornamental horticultural circles. I can see him with a bag full of unseen plants at the time. I reflect back on my experiences collecting plants in South America, Central America, Mexico, Asia, and Africa, now no longer legal in most countries. I so miss it. I wonder how Baron St. Paul ever got the seeds or plants shipped to his father in Germany as there certainly was not the post office or FedEx back then. The airplane had not even been invented. Lucky for us his father was well connected in horticultural circles and shared his plants. Plants were soon being offered in Germany and England, and I am sure spread rapidly throughout Europe. It is reported that as early as 1893 the first commercially produced plants were being offered by a man known as Ernst Benary, of Erfurt, Germany. In 1926, Armacost & Royston of Los Angeles, California imported African violet seeds from Europe. They used the resulting plants to develop ten new hybrids??? This leaves a question in my mind, did “Walter” collect and distribute other species and just what was in the original shipment that A & M received from Europe? Hope they did not have as much trouble getting the plants or seeds thru USDA in California as I have experienced. Thankfully, the original ten clones made by A & M are still available today. Admiral, Amethyst, Blue Boy, Commodore, Mermaid, Neptune, Norseman, Sailor Boy, Viking and # 32. All of these are on my “must acquire list” along with the species S. pusilla. . Although no one will ever know if the violets my great aunt and grandmother grew on their windowsills in Kansas back in the 40’s and 50’s was an actual species or an early hybrid, I can still feel the pride and enjoyment they received from having this exotic tropical beauty enhance their lives particularly in the dead of winter. I will forever wonder how and when they ever arrived in Kansas, and more particularly to the small town of Otis. Thank you Aunt Leah and “Grams” for instilling the love of plants and the beauty of Nature within me. It is amazing and a reflection of the need for man to tinker, tweak and modify things around him. The African violet has been in the hands of collectors and growers for almost 130 years. This simple blue flowered plant has been transformed into a plant I am sure today “Walter” would have a hard time recognizing as the outcome of his discovery. I hope I have inspired others to share some space on their windowsills for the species. On a footnote: It is my understanding that African violets in the wild were never an abundant species. They are now endangered or possibly critically endangered if not some possibly undiscovered species extinct due to ever occurring habitat loss and the simple gathering of wood for fuel. Possibly other factors are also in play. I must disagree with environmentalists that swear plant collection is the culprit. I find this extremely difficult to believe since the plants are so easy to propagate in cultivation. But for whatever reason, we should all save a space on our shelves for at least one species. Let’s don’t let them disappear.